Continuity mistake: When Po is trying to get into the ceremony near the beginning of the film, he pulls himself up on the wall on what appears to be a lantern. Then when the crane creates the wind that blows Po down, the lantern is not there or in any subsequent shots of the wall. Trivia: According to behind the scenes featurettes, James Hong's father owns a noodle shop. Hong voices Po's father, Mr. Ping, who also owns a noodle shop. 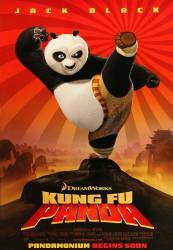 Trivia: While most of the characters have names in English (Monkey, Viper, Tigress etc), several characters' names have their origin in Mandarin: Master Oogway's (wu gui) name means "tortoise" in Mandarin, while "Shifu" (shi fu) means "master", most commonly in martial arts or medicine. Oogway: Your mind is like the water. When it is agitated it becomes difficult to see, but when you let it settle, the answer becomes clear. Po: It is said that his enemies would go blind from over-exposure to pure awesomeness! Question: What kind of animal is Shifu? Chosen answer: According to Wikipedia, he is a Red Panda. Question: At the beginning in the training scene, Shifu was disappointed, pointing out the problems in each of the Five's attack strategy. He said to Crane "height." What did he mean? Answer: He meant that Crane had to be higher in the sky so that Shifu wouldn't notice him when coming in for an attack. Question: Why couldn't Po open the gates to the ceremony but his father could when Oogway declares Po the Dragon Warrior? Chosen answer: They were locked.